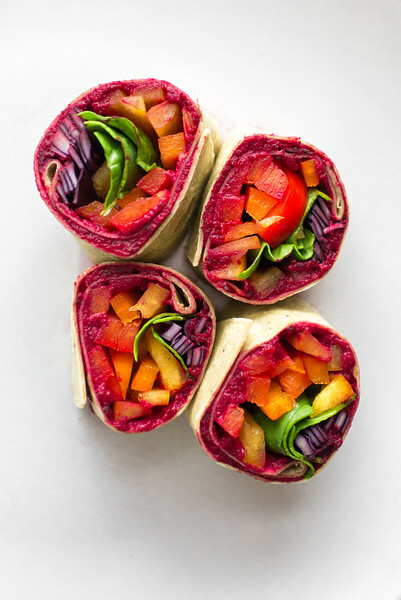 These wraps are easy to customize with your favorite hummus and a variety of colorful vegetables! We have several different hummus recipes on our website that you can experiment with and substituting some roasted vegetables for raw would also be a delicious way to prepare these beautiful rolls. Spread about two tablespoons of hummus on each tortilla, leaving a one inch border on all sides. Line up a thin layer of sliced vegetables across the hummus. Roll up the tortilla tightly. Cut the roll crosswise into four or five pinwheels and serve. These can easily be made ahead of time and stored in the refrigerator, ready for a party, snack, or packed lunch!